There's nothing like family during the holidays...unless one of those family members is in jail, and you're the cop who was responsible for putting him there. 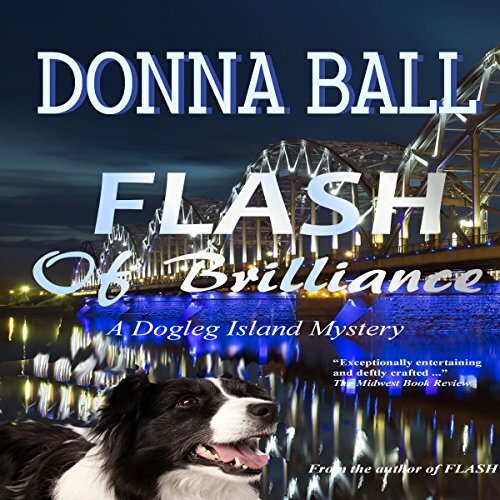 Police Chief Aggie Malone is facing her first Christmas as a married woman, and hoping for a relatively uneventful holiday in the quiet Gulf Coast community of Dogleg Island where she, along with her perspicacious border collie Flash, is in charge of keeping the peace. She is still trying to find her place in the big, boisterous Grady family, but unlike Flash - and her own husband, Deputy Sheriff Ryan Grady - Aggie does not see the appeal of the holiday, and the magic of the season is completely lost on her. The old-fashioned Christmas Grady has planned for his bride begins to unravel when Aggie's investigation into a homicide hit-and-run leads to the arrest of her own brother-in-law and exposes a crime syndicate that's responsible for spreading millions in counterfeit bills throughout the southeast. A police informant turns up dead, and evidence suggests his murder may be the result of corruption at the highest levels of law enforcement. Flash, who is an expert at putting things together, understands that all these pieces of the puzzle are related, and with Aggie's help they'll soon be able to see the big picture. But not even Flash can foresee the demons their search for the truth will unearth. When the shadows from the past reach forward to cloud their future, Aggie, Grady, and Flash find the limits of their loyalty tested, even as they discover the lengths to which they will go to protect the ones they love. This third of the series continues to build on the previous two, with characters intertwining, past issues coming back to impact them all, and new challenges driving it all forward. It feels like the stories get a bit darker in each book, but that may just be me. This narrator is good and easy to listen to. My only complaint (which is going to sound odd) is that she is easy to listen to. Her pleasant voice detracts in a way from what is going on. Perhaps a little more "acting" -- changing tone of voice, tempo, etc. -- for the parts where bad things are happening would improve the overall experience. I am looking forward to the next book in the series! Donna Ball is a fantastic author! I loved this series! This was the first I've read anything from this author, and I can't wait for the next book! this book is very good and I expected nothing less than that from this author... Be prepared because this one is a cliffhanger.